Discussion related to commercial salmon trolling, boats, gear, fishing techniques, electronics, marketing, etc. Was concerned my question would get missed on bottom of page 1, so I will ask it again: Are people using brass marked SAW wire, or the hand marked, which seems to be available but harder to come by? Maybe folks are out fishing? I'm curious to know the answer also. I used the small wire on my floats and really liked it. Depends on size u get but in small diameter it's only available in brass marked. Going to order some 5/64 Monday and think I will go wth brass marked. Since I was the one who started this thread, I should report that I purchased enough 1/16-inch SAW wire for my floatbags at the beginning of last season, and was very satisfied with it. I had some discoloration develop on the starboard float wire, but [at Stan's suggestion] I changed-out my lead cannonball for a different one and the discoloration disappeared. I plan to buy some 5/64-inch SAW wire for my heavies after the good service I had with the purchase I made last season. I was also happy with the quick service from Stan's company. Sadly, this is an aspect of doing business that seems to be disappearing from the ranks of our marine gear suppliers as the years go by. My apologies, we were out fishing. I was raised on the wire with brass markers so that's what I purchased. I'm a simple man. Echo JKD's comments on Stan's service and they take credit cards now. Thanks! I was considering going back to brass anyway, but someone who probably knows better than me said he doesn't like the dissimilar metals on the wire. Don't remember if he was worried about corrosion or putting off fish. However, seems like there shouldn't be much reaction with high quality stainless. Hey! You know what? Maybe if the saw wire is really high quality stainless the reaction is diminished and it doesn't matter too much! I'm not too impressed with how many breaks we've seen, as pictured. What you can't see from the picture is that the broken strands are repeatedly happening just above the mark. This is at the top mark of each pair when it happens. Tired of losing lead. I've gotten a season and 2/3 in on the 1/16" diameter 1X19 strand SAW wire on my floats. I have gotten some broken strands that have shown-up in the 1.5 fathom space in-between the brass line markers. 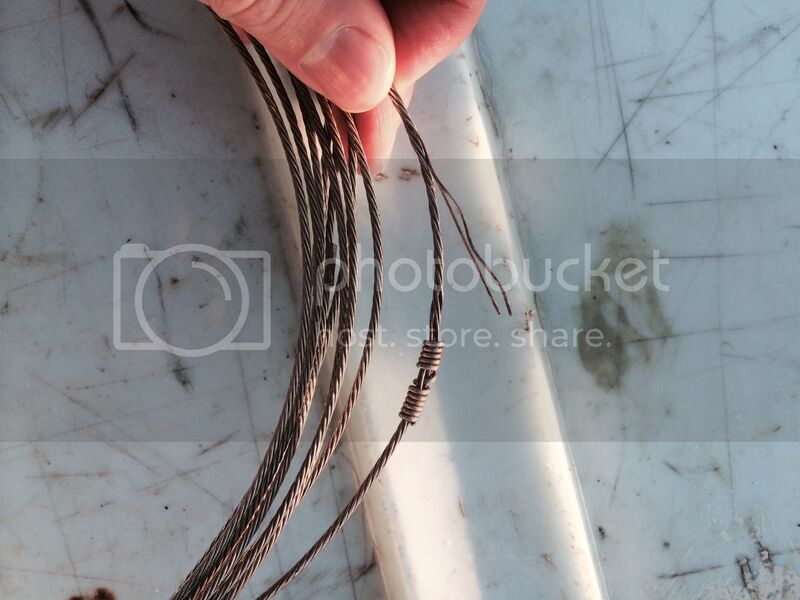 My wire has the crimped beads not the line marks like shown in Brother Dave's photo. I found the 1X19 wire to be very "forgiving" and not as prone to kinks, but if you try hard enough you CAN kink it. I plan to buy some more 1X19 SAW Wire at the end of this summer season. What are folks thoughts on the 5/64" diameter wire from Saw? Jamill45 - Once I finish the winter King fishery in April, I'll be ordering enough 5/64" 1X19 wire from Stan for all 6 spools on my Easthopes. I'm still impressed with the quality of the SAW 1/16" 1X19 wire I've been using on my float bags. In the 2+ seasons I've been using my SAW Wire, I've collected a few partially-submerged logs and a really nasty Hemlock stump on my floats in the last four months, and there was no visible damage to the wire with all of the strain necessary to get the lines up to the boat and clear of the wood. As I said in my 8.30.2016 post above - my 1.5-fathom marked wire has the hand-crimped brass beads. I have had to re-crimp a few of these brass beads that started to slip out of position, but I've had to do the same thing with other brands so I wasn't surprised or annoyed when it happened. You're going to run 5/64 on all spools? No more 1/16 on your floats? Brother Dave - No, I'm going to try the 1X19 in 5/64" diameter all the way around. I have a preference for 5/64" wire - I have used it for years. When I ordered my current float-bag wire from Stan, all that was available in the 1X19 was 1/16". When I noticed that he is now offering 1X19 in the larger diameter I decided to give it a try. Another SAW wire update: I am still using the 1X19 strand 5/64" wire I purchased in April of 2017. I put the same diameter wire on all 4 spools and got 2 seasons out of it with only one kink (that I didn't have to cut-out or repair because none of the strands in the kink ever broke). Near the end of this summer season I noticed some strands breaking between marks, but I discovered that the troll block right above the gurdy itself was not turning properly, and the wire was dragging over the plastic spool instead of riding on it was the spool turned. This situation can can kill your wire (whether it is 7-strand or 19-strand). I replaced that block immediately and kept an eye on those spots and finished the season without any splicing. I figured one or two strands out of 19 in a section didn't cause much of a reduction in strength. I began to see some of the brass marks slipping near the end of the first season, but I could always move those marks back close to their original position and I would lock them into place with a slotted 1/16" brass repair sleeve butted-up to the "slider" just below it on the wire. For good measure I would also crimp the "slider", too. I am favorably impressed with the SAW wire. I believe that if you have good quality trolling wire blocks, and they are centered properly so that the wire feeds back and forth on the spool when you are retrieving it, you will also be impressed with the durability of Stan's product. I'm buying more of Stan's product before this coming summer season. I like to use 6 in pullies on my heavies they are kinder on the wire over all. I've gotten 4 years out of my saw wire, we have a lot of crab pots down hear off the Columbia and have only one splice in 4 years .